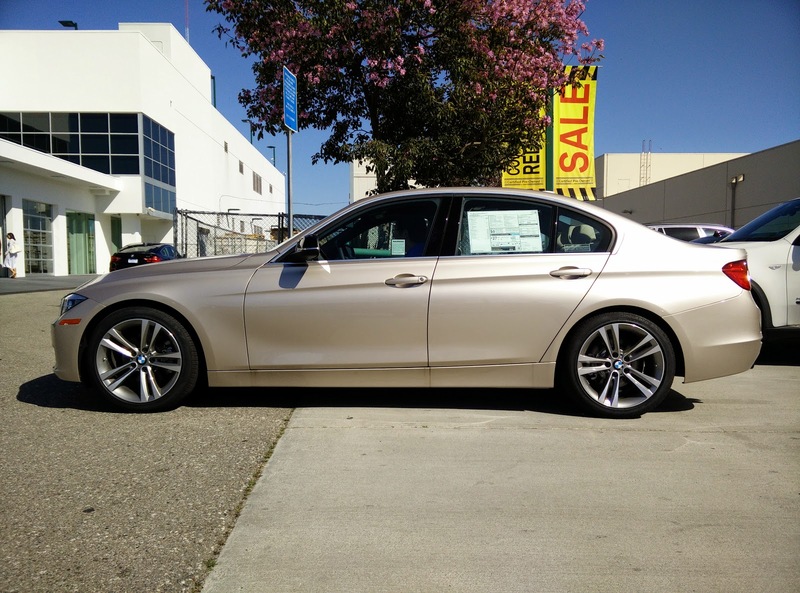 This entry marks the beginning of our mid-size luxury sedan comparison. We have opted to look at what should essentially be the volume seller versions of all the 4-cylinder, automatic transmission equipped mid-sized luxury sedans on the market and offer our thoughts on each before wrapping up with a serious look at how they compare against each other. As much as possible, we spec'ed each car as close to a strict set of requirements as possible, requiring no more than 250 hp from a four-cylinder engine for maximum fuel economy, an automatic transmission, navigation, seat heaters, and leather seats. The goal was to approach this as though we were a real buyer looking for a specific setup of car to see what we would really pay if actually shopping today. BMW's latest version of its 3-series sedan, dubbed the F30, is a car that we have reviewed before. However, the previous car we tested came equipped with the "M Sport" package as well as a six-speed manual. Being enthusiasts, this is normally the type of car we would go for, but not everyone is an enthusiast that wants a sporty suspension and a manual transmission. What if we just want a nice, mid-sized luxury sedan that would shuttle us from point A to point B without having to worry about a stiff suspension setup or rowing our own gears? And so we set off to the local BMW dealer in search of such a 328i, and came across this particular model equipped with the "sport line" package. The one thing about most luxury car manufacturers these days is that everything seems to be a paid option. 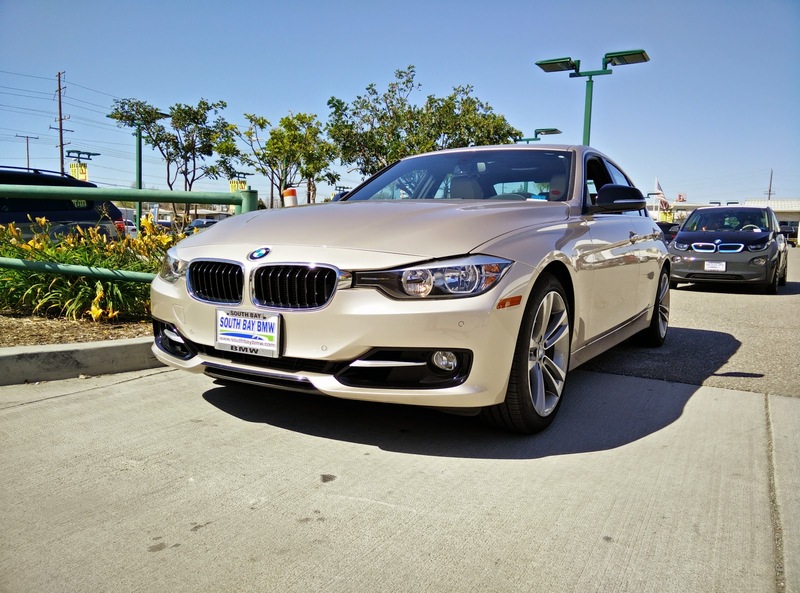 While searching through the local BMW dealer's inventory of 3-series sedans, almost every single one had a different equipment set with a different MSRP. While this does allow the buyer to pick a car that will better cater to their needs, it can be daunting having to look through all those cars just to find the one you want. More often than not, you are stuck having to settle for a car that is missing one or two things you want. That is unless you are willing to custom order a vehicle, which pretty much eliminates your ability to haggle on the price. East Brother and I were looking for a car that had similar equipment to a Honda Accord Touring, which we thought was a fairly reasonable expectation for a mid-sized luxury sport sedan. 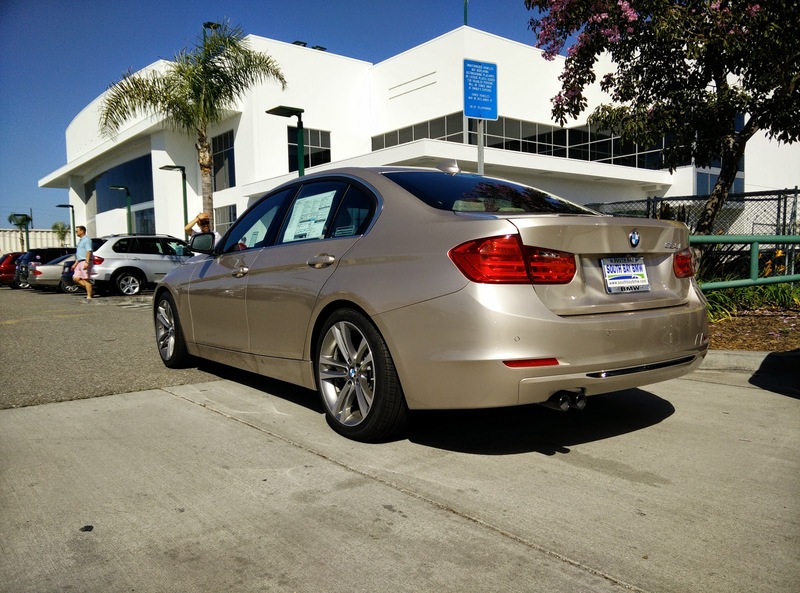 Eventually, we settled on a gold colored car with the Sport Line package. There really is not that much to say at all about the looks of the 3-series that has not already been said. BMW has been evolving the same design for years now. Sure, it looks handsome, and it looks conservative...and that is really all there is to it. I am not a huge fan of the color of the car we test drove, but if there is one thing the 3-Series has a lot of, it is color options (most of which you have to pay extra for, by the way). The 18-inch Sport Line wheels look much more aggressive than the standard 17-inch wheels that come with the car, and simply make the car look more aggressive overall. Honestly though, there really is not much more to say than it is typical BMW. Same sausage, different lengths. As we move into the interior, the first thing I noticed was the shift knob. 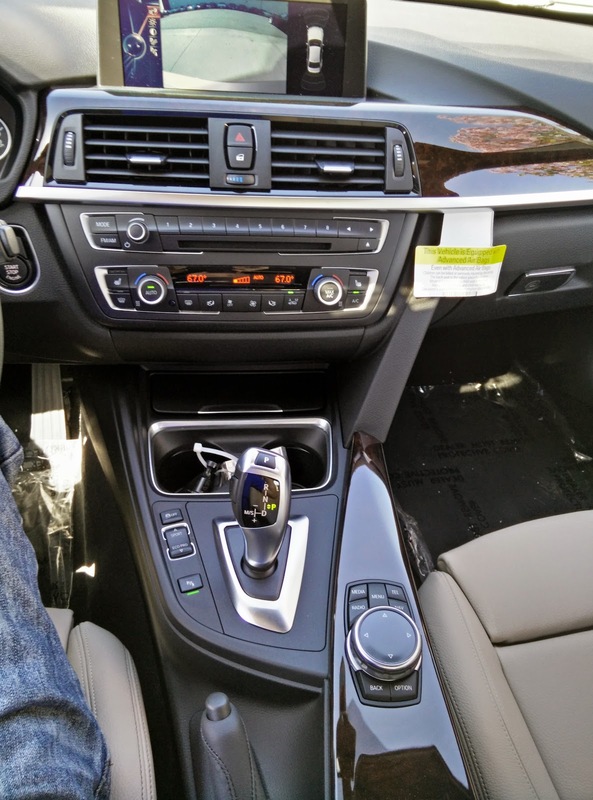 For a while now, BMW has switched over to using one of those weird looking joystick deals for a shift knob. It is a bit strange and is definitely something one would just have to get used to using. To me, it is just another bit of complicated electronic equipment waiting to break. The rest of the interior was quite good. Leather felt nice, the wood trim looked like it was made from quality materials (even though it looks rather fake), and the plastic surfaces all felt like they were made using plastics of a reasonable quality. Considering the MSRP of this car though, I expected more. Much, much more. While the interior looked and felt nice, it was honestly no better than a car that costs $20,000 less. Also, if you are going to equip the car with a navigation screen, please do not make it look like an afterthought. I just do not understand why German car manufacturers have a tendency to make their navigation screens look like something that was tacked on last minute because the designer forgot to add it during the design phase. BMW touts its vehicles as "the Ultimate Driving Machine." Seeing as we did not think the 328i with the M-Sport package and six-speed manual could be considered the "ultimate driving machine" two years ago, both East Brother and I questioned whether or not this automatic equipped version could do any better. Sure, the drive modes are all the same as when we tested the car two years ago, but with two model years under its belt, has BMW changed the way the 3-series drives? Well, one thing is for sure: the car still has plenty of thrust and still corners pretty flat, even without the fancy M Sport suspension. All good things for a car being sold as a sport sedan. Unfortunately, the brakes are still as blah as ever, and the steering is still has too little road feel. It is very hard to praise a vehicle as the "ultimate driving machine" when there is little brake progression and I cannot tell what the front wheels are doing through the steering wheel. Hey, at least this time we did not have to deal with that extremely cheap feeling manual transmission. The biggest gripe of all though? The price. Yes, if you noticed at the top of this article, this car has an as equipped MSRP of $50,000. Mind you, that price does not even include HID or LED headlamps. Even worse, if you do not add the lighting package, BMW seems to think it is okay to equip a $50,000 mid-size luxury sedan with halogen reflectors for headlamps. Even a $21,000 Honda Accord LX comes with projector housings for its halogen headlamps as standard equipment! What gives? Worst of all, when you close the doors, it sounds like a cheap rental car. What happened to the BMWs of yesteryear that had doors that closed with the hearty thud of a bank vault? If you are going to make me spend $50,000 on a car, you better damn well make sure it is worth every single penny. 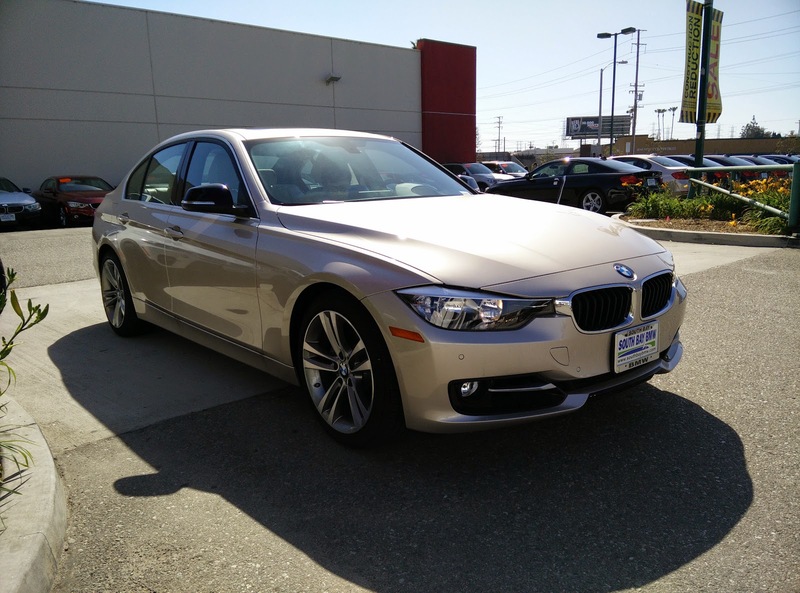 As it stands, the BMW 3-Series is not worth the price of admission. But hey, at least the dealer is offering free hand car washes seven days a week for the lifetime of the car, so...I guess there is that to look forward to. 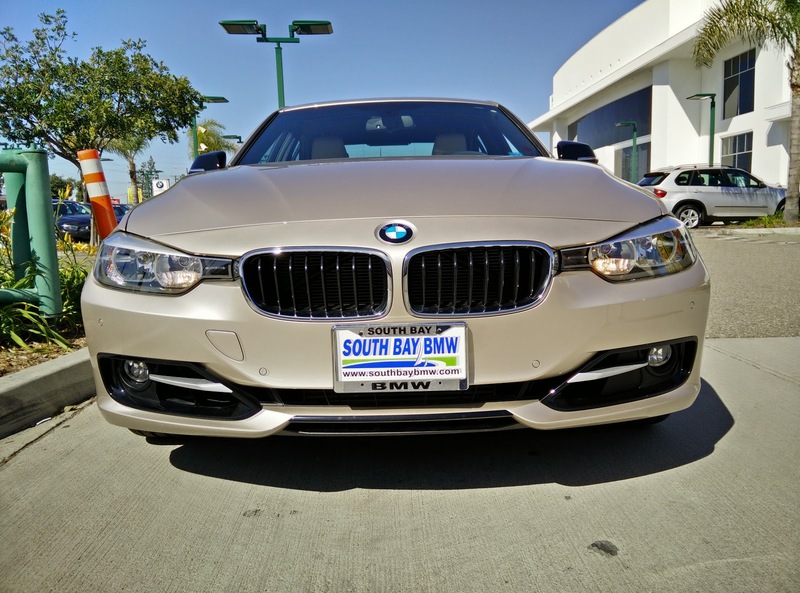 *Special thanks to South Bay BMW for giving us some wheel time behind one of their cars.